Bonnie Jenkins is a retired U.S. Naval Reserve officer, diplomat, and expert in international security, arms control, treaty laws, and nonproliferation and disarmament of weapons of mass destruction. 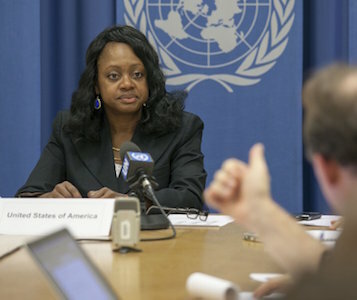 Beginning in 2004, Jenkins worked as a program officer for U.S. Foreign and Security Policy at the Ford Foundation where she was responsible for strengthening public engagement in U.S. foreign and security policy formulation as well as funding programs related to peacekeeping, women in conflict, and natural resource priorities. She also oversaw the foundation’s efforts to support nongovernmental organizations working in areas related to security. In March 2006, despite preparing to retire after twenty years in military service, Jenkins received notice that she would be deployed to Iraq for active duty as a Naval Reserve Officer. Her assignment was changed, however, and instead she was sent to the U.S. Central Command (CentComm) in Tampa, Florida, which oversaw U.S. military operations in Afghanistan, Iraq, Lebanon, Pakistan, Somalia, Sudan, and Syria. Jenkins served at CentComm for one year and then retired from Reserve duty and returned to the Ford Foundation until 2009. Given her extensive background in military strategy, diplomacy, and terrorism security, in 2009, President Barack Obama nominated Jenkins as coordinator of Threat Reduction Programs with the rank of ambassador. She was confirmed by the U.S. Senate in June 2009 and assumed her duties immediately in the U.S. Department of State’s Bureau of International Security and Nonproliferation. As coordinator, Ambassador Jenkins is responsible for coordinating the State Department’s assistance programs to other countries, aimed at reducing nuclear, chemical, biological, and missile threats. She is also the department’s lead liaison to the White House on its preparation for the Nuclear Security Summits. Ambassador Jenkins’s formal education includes: a bachelor’s degree from Amherst College (1982); a juris doctor (JD) from Albany Law School (1988); a Master’s of Public Administration from the University of Albany, State University of New York (1988); a master’s (LL.M.) in law from Georgetown University (1995); and a doctorate (Ph.D.) in international relations from the University of Virginia (2005). Official State Department Bios; Bonnie Jenkins “Inside the 9/11 Commission; Nichole Chi. 2012. The Amherst Student, “Fearless Ambassador Ensures National Security.” http://amherststudent.amherst.edu/?q=article/2012/11/12/fearless-ambassador-ensures-national-security. Nichole Chi. 2012. The Amherst Student, “Fearless Ambassador Ensures National Security.” http://amherststudent.amherst.edu/?q=article/2012/11/12/fearless-ambassador-ensures-national-security.